A dirt brown strip , bright green square and corn yellow outfield fresh from the first cut of the year made it a difficult toss to call. Having decided to bat , the Buccs openers had little to thank their captain for as anything spanked off the square was brought to an abrupt halt in the lush corn. Tom Fletcher secured one end as a series of swashbuckling Buccs came and went at the other. Tom saw us through to lunch at a slightly uncomfortable 93 for 6. 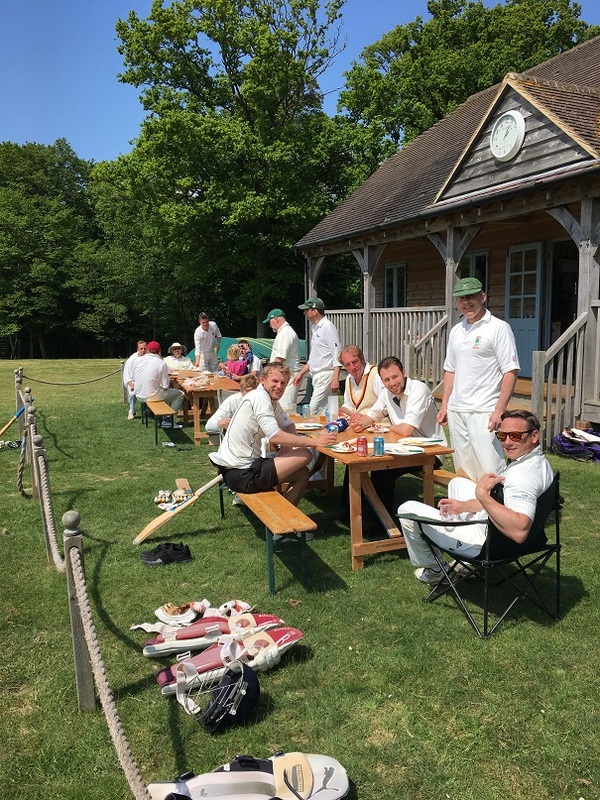 But a decent stand with Will Metcalfe either side of lunch started the recovery with Fletcher nurdling an extremely useful 30 and Metcalfe stroking a fluent 19. Ironically it was two (playing for the opposition) Buccs who did most of the damage with Harry and Ollie Mann returning 3-19 and 3-54 respectively. Stephen Moules found the middle of the bat almost immediately and hit a quickfire 20 in the company of Rob Rydon who , not for the first time , had the opposition asking “what’s this guy doing at number 9?”. Suffice to say that a typical barrage from the Rydon artillery saw him chalk up a rapid 67 not out with the skipper adding a few at the other end. All in all 226 for 9 declared felt like a reasonable total given the sluggish outfield. The Armadillos started their reply strongly with Jim and Harry Mann coping with all that Rydon and Moules could throw at them. Things took a turn for the worse when Rydon ‘did a Glenn (not Anthony) McGrath’ attempting to stop a run off his own bowling at which point he adjourned to the boundary with a couple of cold Fosters (on his ankle) for the remainder of the game. Will Metcalfe stepped in and bowled a tight line but it was Moules who drew first blood, finding a stopping delivery that drew the younger Mann into a return catch to the bowler. With Moules giving way to Freddie Bjorn and new boy Felix Hickman running in hard at the other end, wickets began to fall steadily with two to Bjorn’s nagging line and one to Hickman’s pace. Charlie Leefe found some turn but not much luck before the skipper lured Jim Mann into an enormous heave which he will still be rueing as it caught a thick edge to Tim Brocklehurst at slip. Mann deserved 50 but fell a run short. With over 100 required from the last 20 overs and the drying outfield quickening nicely the Dills saw they still had a chance and began throwing the bat with some success. S Meeke hit some lusty blows and (aided by some butter-fingered Buccs!) got the Dills to within 30-odd of their target. At this point the Buccs still needed four wickets in only four overs so it was anybody’s game. Cometh the hour, cometh the man . Having bowled tidily in his first spell (0-25) Metcalfe ran riot in his second with 4-4 off just two overs which was enough to clean up the Dills innings and conclude a fine 25 run win for the Buccs. So another cracking game at a glorious venue with the added benefit of a sumptuous lunch and cloudless skies.